Sri Lanka’s position paper on Climate Change given at the COP21 in Paris stated : “We are aware that the optimum operating temperature of chlorophyll is at 37 deg C. In a warming world where temperatures will soar well above that, food production will be severely impacted. We would request the IPCC to address responses to this phenomenon”. This statement is now being vindicated by the temperature profiles that we are seeing over the planet. July 2016 was the warmest on record. Thankfully the bursts of extreme temperature are restricted to short episodic events, but the trend is that these events will become more commonplace in both frequency and duration. Heat-waves will become a disturbing phenomena that leaves little room for adaptation. Why are heat waves so dangerous? It is because extreme temperatures experienced in heat waves often exceed the threshold for enzymatic activity. In humans this phenomenon leads to heat stress results in death. The same pattern follows for plants and animals. But I a warming world, long before thermal collapse, we would have succumbed to hunger. All of agriculture depends on the good growth of plants, all plants rely on their chlorophyll to grow and produce. Chlorophyll is a molecule that functions to an optimum at about 37degrees, above that temperature, its performance falls. 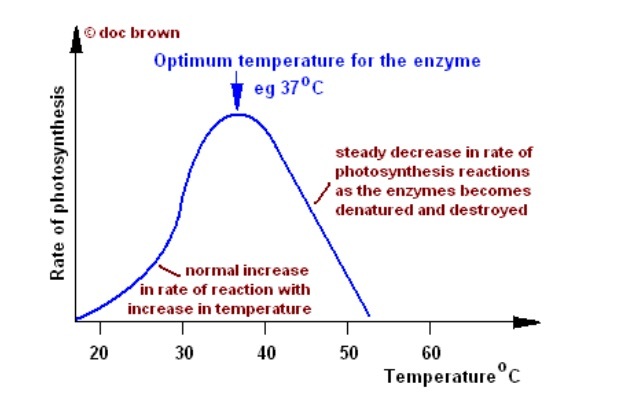 In heat waves often exceeding 38 degrees plant productivity will impact photosynthetic productivity and there will be a yield drop (fig1). The danger to agricultural production is further exasperated by the reliance on chemical farming with so-called ‘high yield ‘ crops of the so called ‘Green Revolution’. These crops have been bred by reducing the plant’s maintenance biomass (leaves and roots) in exchange for crop biomass (seeds or fruit). The reduction of the plant’s natural defenses being made possible by the use of chemical fertilizers and toxins (fig 2). But in a high temperature situation when chlorophyll is functioning sub-optimally such reductions in leaf volume will bring serious crop losses. Chemical fertilizers are produced using large amounts of energy, usually fossil energy. The creation of this fossil energy results in the discharge of huge volumes of Carbon Dioxide into the atmosphere. This, in addition to the fossil carbon footprint of agro toxins and fossil fuel use adds greatly to global warming which in turn creates the dangerous heat waves around the planet and finally affects the farmer through increased heat stress on the crop. What are the ways out? One would be to look for plants that have a wide heat stress tolerance; another will be to design future agroecosystems that can use the heat reducing mechanisms of ecosystems to respond to temperature raises. However one urgent national needed to deal with climate change is to begin mapping out high risk areas in the future and warm farmers in those areas of the steps they should take to adapt to the oncoming changes. Probability maps need to be constructed for temperature, rainfall intensity, wind intensity and salt-water intrusion. The current rush in high rise construction needs to be critically examined under such a scenario. Recent studies in the US conform that air conditioning is a major contributor to Climate Change because of the use of hydrofluorocarbons (HFCs). HFC’s are 3830 more powerful than Carbon Dioxide as a Greenhouse Gas. The Fossil Carbon cost in generating the energy of such air conditioning has not been addressed. Nor has the contribution of Carbon Dioxide in making cement which works out that cement is sixteen times more powerful, weight for weight, as petroleum is in producing Greenhouse Gasses. The tragedy in Sri Lanka is that while such statements are made and when even the President promised a fossil free path to development, the country is being carved out to be parceled out to ‘ industrial developers’ with no limits on the percentage of impervious surfaces that can be allowed and who are set to increase Sri Lanka’s Carbon Footprint exponentially with massive urban infrastructure based on concrete and air conditioning. This unreported and unchecked growth of Carbon Dioxide outpouring will increase our Carbon footprint and with each rise in our carbon footprint we ensure the inevitability of a heat stressed future that will place all of us on a hot seat to disaster ! Thank You Dr Senanayake for this explanation of the Armageddon that awaits us. AND, it will surely come. Your last paragraph is the punchline. Time and time again when I have broached the subject local politicians have looked quizzically and quipped ‘all well and good talking about climate change but nobody tells the big countries to cut back on their energy heavy projects’. It will take many disaster to bring all our folk round to the idea that our planet needs saving, and that everyone needs to their bit. Tree cutting continues unabated by thieves, the military and various urban municipalities and their contracts in the country. In Sigiriya 3 ancient Mara Trees were poisoned and died. So too in Viharamahdevi Park there are very few large Mara trees left. They have been looted. Colombo is becoming a green house, because the municipality keeps cutting trees. Thank you so much for conveying that valuable knowledge to CT readers. It’s no doubt a wake up call for human beings to act and ensure the continuity of life on mother earth. Let nature decide our lifestyles; even a pin prick upon it has an impact, most probably a negative one. Ranil, that ‘hot-seat’ that we are on and that is being exacerbated by those “‘ industrial developers’ (encouraged by our Yahapalanayas) with no limits on the percentage of impervious surfaces”, and the “reliance on chemical farming with so-called ‘high yield ‘ crops of the so called ‘Green Revolution’”, is getting hotter by the day. And in even though “.. the President promised a fossil free path to development”, we know that his promises are like that proverbial ‘pie-crust’ that crumbles at the touch. What to do(? ), except to keep fighting the good fight ,as you have been doing for (literally) decades. In Sri Lanka the garbage collectors refuse to take plant leaves and wood and encourage public to burn it. Sri Lanka do not understand the gravity of the situation. Why don’t some one collect plant leaves, wood reside etc., and start a business of organic fertilser ? in Australia the City Councils provide three garbage bins. One for Recyclables, One for Green Waste such as Grass cuttings and prunings etc, and one for general waste, which is the least full on collection days. People are also encouraged to have another Bin for household refuse, such as vegetable peelings etc, which is converted after some time to a compost which can be used in the garden. What is needed is awareness, and it should be started in Schools and in Temples. In the arboretum at Dambulla (well worth a visit), the founder, Sam Popham never discarded foliage and twigs that fell from the trees but swept them neatly around the base of the trunks to develop into a mulch. I feel this could be done in places like Vihara Mahadevi Park, too, where I have often seen the precious leaves gathered into bags – for dumping? I wonder what happens to them. We have no oil & gas; we have no oil palms plantations. We have no money coming in from rich immigrants and/or rich refugees fleeing from communist dictatorships or otherwise. So what is little Sri Lanka building all those buildings on our delicate island, to further exacerbate climate change? The only thing we can do to justify the skyscrapers is to support the China attempt to wrestle the West off their financial control. And on our side, to release more land for oil-palm plantations by destroying our natural forest reservations (and Ranil probably sees them as unproductive lands). What a cowardly way of making financial books look good, and for the Elite of Sri Lanka to migrate/abscond to the West with their financial earnings. This is exactly what the West wants: After all trees of the Tropics have been cut down, after all the skyscrapers have been built, White Amish organic and non-GMO agriculture will triumph in the West. Shucks, we lost again! When all is grain and no leaf, all is naked. RamonaTF I want you to rest assured that come the day when we are all naked, you wont be. I have saved some fig leaves that will spare mankind the frightening sight of you in the buff. You will then be suitably dressed to enjoy our once delightful hamlet of Mirissa, now scarred by the monstrosity built by Marriott, to enable your beloved Amish tourists a $200 per night watering hole in our beautiful south. Sometimes on a golden moonlight night I swear I hear the gently weeping of Sita as she contemplates the sad fate of Mirissa bay from where you can see both sunrise and sunset. I promise you Ramona, the Gods that protect this beloved isle will surely punish those who would desecrate it, and leave it a rubbish dump. Speak for yourself. But aren’t you the one who keeps moaning that you are stuck in in the place? Aren’t you the one who keeps encouraging people to send their children abroad to study? Standing around and having fun with the whole situation to entertain the natives, and then falling back feigning deep caring….. you give nothing very substantive……typical, typical…. Glad I can see things from a wider vantage point from here, and give advice. There are other things that did not discuss here. With the global warming which is here now, another group of crop plants (C-4 such as corn) are expected to yield better than Paddy (C-3) plants. That is related to photosynthesis. Additionally, DEveloped countries have banned most high toxicity pesticides. Other low toxicity pesticides such as pyrithrins are used cautiosly and only when required. In relation to above, Sri lanka is very backward. They are still arguing whether to ban high toxicity pestice and glyphosate etc. I think with the increase of temperature, Weeds and pests also grow mater. Because of that, where ever possible , Famrers have to go for low yield but high value products such as old varieties. New varieties need fertilizer and pesticides which are expensive and very toxic to the environment and fish in the water ways. Global warming is here. Only thing is desertification and also the frequencey of flash floods will increase. You’re talking about GMO’s. All the toxic pesticides have already been spliced into the DNA of corn, wheat and ancient grains, fruits and vegetables. We should be stopping and reversing global warming. 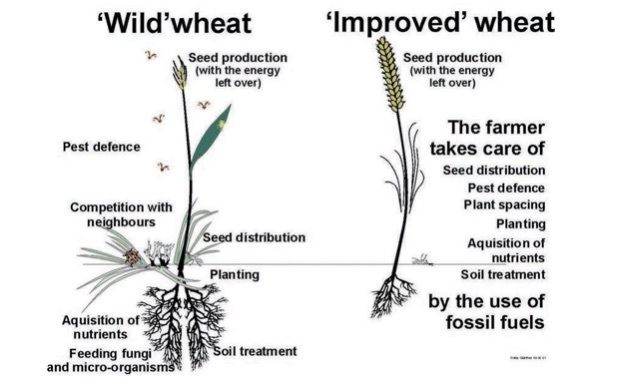 We should be preserving and enhancing our ancient grains and food supplies.